Rare Bird Books, a Barnacle Book, 9781945572104, 280pp. Walter Braum is pregnant with his own twin brother and, frankly, he's having one hell of a time figuring out how to tell people about it. The forty pounds he thought he had accrued by gracelessly compromising his way through life is actually a human being he has unwittingly carried thirty-five years to term in his abdomen. It is an exceedingly freak manifestation of a rare medical condition called Vanishing Twin Syndrome. But it is also a sudden thorn in Walter's psyche, bringing into question most everything he thought he knew about himself and his life. To make matters worse, when Walter's twin is born, he proves a highly functioning adult with fresh eyes on a world turned long ago stale to Walter. Although the twin's body is diminutive and malformed, he has a voracious intellect, an effortless charm, and proves to be a preternatural business savant uncannily able to turn profitable everything that his ambition touches. In the searing light of his twin's boundless adroitness, Walter is forced to face the self doubt and personal recrimination that has stunted his growth for decades. So Walter decides to strip his life down to essentials and to set out after the strongest passion he can remember having: his youthful desire to be a rock star. Granted, Walter can't play an instrument, nor has he ever taken a lesson. Nor does he have even a modicum of his twin's talents. But these are precisely the types of obstacles that his twin would shatter in pursuit of his goals, the types of obstacles to which Walter refuses to heed any longer--even as his rock-n-roll lifestyle proves to be anything but, and the discarded facets of his former life simply refuse to disappear without consequence. My Vanishing Twin is the story of a man who sets out to realign his life with his purest, long-forgotten ambitions under the oddest of medical and familial circumstances, only to find that none of his pursuits--not music, not success, not business and industry, not beauty or truth, and not even sibling rivalry--will alleviate the responsibility he must take for his own life decisions. 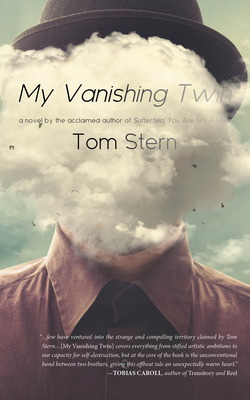 Tom Stern is the author of the novels My Vanishing Twin and Sutterfeld, You Are Not A Hero, published by Rare Bird Books. He is also the writer/director of the feature films Half-Dragon Sanchez and This Is A Business. Tom's films have played festivals across the United States and in Europe. He holds a BA in Philosophy from Eckerd College and an MFA in Film Production from Chapman University.